Its important that a ground cover be successful. They are meant after all to cover the ground, block weeds, discourage erosion, provide a uniform look. After trying many ground covers and the famed “squashables” as we call them (plants don’t like to be stepped on- that why we play football on grass and not Corsican Mint). This is a vigorous evergreen (black) dense growing plant that literally crowds out the competition rather than obscuring it. 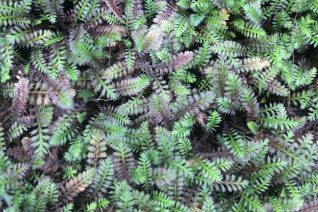 Tiny, ferny foliage takes on dramatic black tones when mature or the lightest bit stressed. It prefers non-compacted loose friable soil to roam with regular summer water. Full sun creates the darkest foliage and creates the densest plant. If planting in between pavers know that repeat stepping on the stones will compact the soil around them- not many plants especially ground covers like this. To combat this spread a layer of compost right over the plant in early spring. it will quickly grow through it and love the nutrients and oxygen in the soil that it provides. Little inconspicuous button flowers are easy to miss. To 1j/2″ tall and several feet wide.